The all important question, "Does P90X work?" Frankly it can work, but I really don't like it and don't think it works for most people. My P90X review, in a nutshell, is that it's mostly slick marketing. Of course you might be able to make it work, if you have the money and are exceptionally dedicated. But for most people, no. Beachbody's P90X workout program is impressive in its scope. I bought a basic P90X course to see if it was all it's cracked up to being. Because I'm a cheapskate, I bought it used on eBay. My gut instinct was that I don't want to drop a ton of money on a system to review, so I was a bargain hunter. 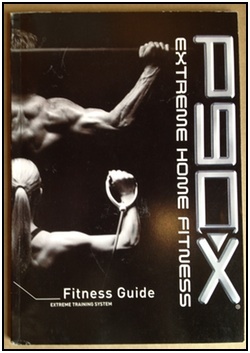 These three guides outline the P90X fitness and nutrition and workout system. In exhaustive detail. Oh, and the DVDs have the workouts. One thing I like is that everything is spelled out to the letter. If you manage to read the whole system and look at it all together, there's a lot of good workouts and nutrition ideas there. But, one major flaw is that it's a HUGE system. Just reading through all the workouts and finding out exactly what is required from you on each day is a daunting task. The Quickstart Guide really isn't much of a help. If you can read and digest the info, great. But it's hard, especially if you want to just jump right into exercising. There are 12 different workouts on the DVDs. The plus of this is, I guess, that you'll never get bored burning calories and building muscle. I personally think this is just a recipe for confusion. But actually, confusion is the major goal of the workout. Muscle confusion that is. See, there's this theory that if you change up your workout frequently you'll see greater muscle gains. Your muscles will get 'confused', and grow more with each different workout. The concept of muscle confusions is B.S., in my humble opinion. A given muscle can only contract in one direction, and no amount of variations will make that muscle contract differently. That's just how muscles work. Now, I'll be the first one to say that a workout can get old and new lifts and movements can be fun. But don't do some stupid 'muscle confusion' thing - you'll just be deluding yourself. Also, they have kenpo karate and yoga workouts, which (if you want to do them right) you'll need a competent teacher for. I really think that, with the intensity and frequency of the workouts, and the movements they want you to do, you can hurt yourself with these workouts if you're not careful. 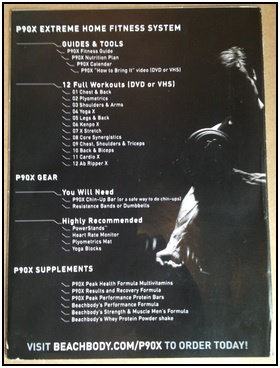 The P90X quick start guide is essentially worthless. It lists all the equipment you need to start the program (an absurdamount), as well as all the supplements and other garbage they want you to buy. Basically, it's a sales brochure. It's purpose is to make you spend more money on Beachbody merchandise. Worthless. For starting quick, does P90X work? No. The P90X nutrition guide has recipes for different calories levels, based on how much you weight. And I like the recipes - they emphasize healthy, basic foods, eating in moderation and in small portion sizes, and eating to fuel your exercise (not solely for pleasure). Now, the P90X diet (in all its forms) is a classic low-fat diet. Which can work, though fat isn't inherently bad for you. There are three phases to the eating plan - fat shredder (first 30 days), energy booster (second 30 days), and endurance maximizer (last 30 days). Cute names, and they emphasize different types of eating (basically, more carbohydrates as you go along). 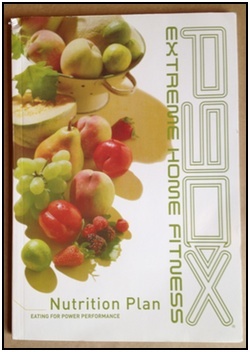 I like that the P90X nutrition guide emphasizes healthy, real food. I like that the nutrition guide has you count calories, if inexactly sometimes, and gives you real (really simple) recipes. And, if you eat more when you workout then you can put on muscle. If you eat less, you'll lose weight (mostly fat). These fundamentals don't change. The 3 different 30 day phases (fat shredder, energy booster, and endurance maximizer) are also very helpful. They make you focus on different eating styles, and really make you pay attention to what your body needs. First, the nutrition guide makes a big deal about eating enough. That is, they say the P90X program is so difficult you need to eat more. Which is probably true in a sense, since the workouts are very difficult, but it's also music to many people's ears. If you eat more then you'll find it hard to lose weight. Actually, impossible - unless you just increased you output, through working out, a TON. I think the 'you need to eat MORE to get ripped and lose fat' is just lying (marketing). You can use this plan to lose fat, don't get me wrong. But it's the same as any other eating plan - eat less to lose fat, or workout hard and don't eat more (creating a calorie deficit). Now that you've got the P90X Extreme Home Fitness system, you obviously need to spend more money on a ton of exercise equipment. And not just any equipment; special P90X home exercise equipment! ...A safe way to do chin-ups? How about a regular chin-up bar from a garage sale. And it actually costs a pretty penny to buy a full set of resistance bands or a home dumbbell setup. I'd go with an adjustable weight dumbbell pair just to save money. The plyometrics mat is basically a yoga mat. I don't like this because they're just asking you to spend more money after you bought their system. Shouldn't you be able to just start your home workout after getting P90X? And not get the unexpected surprise of finding out you need to spend more money? Does P90X work without all this junk? Or at least most of this junk? No. These supplements are listed in the quick start guide as 'highly recommended'. Now, if you've seen me write about supplements before you'll know that I think most of them are garbage. And for good reason; most of them are garbage. Does P90X work without six supplements? I really hope so. A multivitamin is fine. Protein bars are OK, but why do you need to buy their special brand? Whey protein is handy for milkshakes, but again, why do you need their special brand? And then there's the host of specialized recovery and performance formulas. Which probably contain creatine at least, but seriously - do you really need to shell out another $100 or $200 dollars on supplements after you've shelled out for the P90X system? Does P90X work? If you need buckets of supplements to get results, it ain't much of a system. Whey protein and a multivitamin are good tools, but you can get them cheaper someplace else. This is just another way that Beachbody is trying to get your money. You sink a ton of money into P90X and therefore you become invested in it. You actually stick to the workout program since it cost you an arm and a leg. If you eat less and workout more, like it outlines in the program, you'll drop fat and look hotter. When you buy it you get access to the P90X web forums, which can give you the social support you need to stick with your workout. 90 days is enough time to do a full body recomposition, and significantly change your body. However, I think there are much better ways to spend your money and time. Find a good calorie tracing software, buy a gym membership, and start working out and getting active. If you really do the P90X thing, you'll be sinking several hundred dollars into the books, DVDs, equipment, and supplements at a minimum. If you buy everything, it can get exceedingly expensive. Simple habits and lifestyle changes are what you really need, along with calorie tracking. It's seductive to think that there's a special program that, if you only buy it, will solve all your workout problems. But that just isn't so. Also, since P90X is a 'home' workout system I believe it appeals to people who don't want to go to the gym, or feel ashamed of working out in public. People who would rather spend money than work to change their life, or don't know a lot about fitness. These are the people who need to get competent advice and quality gym and workout time the most. Don't be seduced by slick promises and your own desires. Take a close look at your diet, workout and eat less to lose fat, and work hard at being active and enjoying your life. That's the big secret; there's no secret. • Click here to leave 'Does P90X Work? Here's Why I Don't Like It…' & go back to the Home-page!